18 rooms, all w/ private baths, breakfast included. Our favorite local accommodations, with beautiful grounds, popular local swimming hole right on the stream, homemade muffins and baked goods. Only four rooms set aside for Woodstock Invitational weekend, returning regular customers for October leaf-peeping season usually book the place up by mid-Summer, so reserve early, book now!!! Keeping Woodstock groovy since 1945. 14 Renovated rustic rooms + 5 new rooms with private decks and 16' ceilings. Beautiful heated saltwater pool with Jacuzzi. Continental breakfast included. Enjoy dinner, live music and take in the sunset on our expansive deck. Check out our website for daily specials and events. 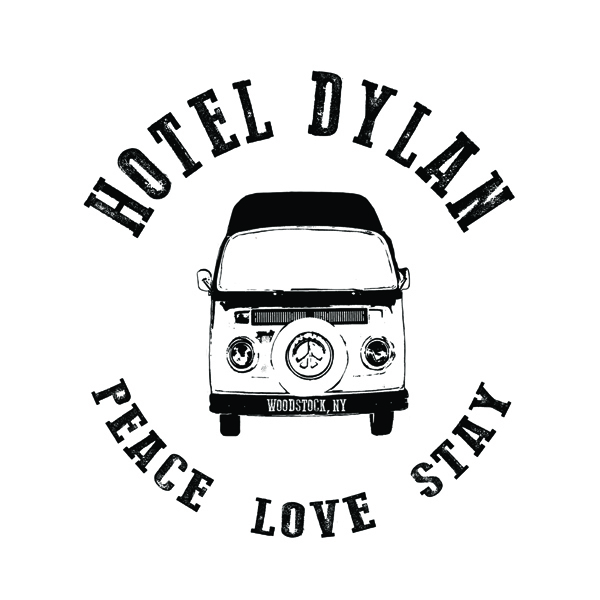 The Hotel Dylan has storied ties to Woodstock embracing influences from both the rich history of the artists and visionaries who shaped a generation, as well as those shaping the future. Enjoy our “vintage modern” style and downtown-chic aesthetic bolstered by contemporary creature comforts. The Hotel Dylan is located at the intersection of Rt. 28 and Maverick Road, 3 miles from the village of Woodstock, complimented by the Santa Fe Restaurant on property and ideally situated to access the Woodstock Invitational Luthier Showcase. 3 rooms and a two-bedroom suite, all with private baths, breakfast included, in a historic 1840s building. In neighboring Saugerties, convenient to NYS Thruway Exit 20 and about 20 minutes to Bearsville Theater. 208 rooms from $242 and up weeknights, $275 and up weekends, breakfast included. Indoor Pool, fitness center, restaurant, bar, etc. Near I-87/NY State Thruway Exit 19 Kingston. About 20-minutes from Bearsville Theater. We have arranged DISCOUNTED RATES for limited blocks of rooms at this motel for Woodstock Invitational Exhibitors and Attendees. Special Offer: 20 rooms available at $125 per night Wednesday, Thursday and Sunday; $155 per night Friday and Saturday, complimentary hot breakfast included. These rooms must be booked before Sept. 28, 2018 to receive Discounted Rates. These group discount rates can only be accessed by a direct call to the hotel, 845-338-0400, or email to dharris@cooperhotels.com. Ask for the Woodstock Invitational Luthiers Showcase discount rate. Courtyard by Marriott Kingston, NY hotel, located in the heart of the beautiful Catskill Mountains, is your destination hotel in the Kingston, NY area. Our newly renovated lobby, featuring The Bistro* with Starbucks, and our spacious guest rooms make us the smart choice in Hudson Valley Hotels. We are just minutes from the New York State thruway (I-87). Kingston, NY is the first capital of New York for which the area is filled with history and pride. Business or leisure, our Courtyard Kingston Hotel, will help you to relax. Regular rates mid-week range from $189.00 to $209.00, while weekend rates range from $249.00 to $309.00 per night. About a 25-minute drive to Bearsville Theater. We have arranged DISCOUNTED RATES for limited blocks of rooms at this hotel. Special Offer: The Woodstock Invitational group rate is only $139.00, plus taxes, per night, Wednesday through Sunday nights October 25 – 28. Got a large group? Contact John Mower, Win Morrison Realty, Woodstock, NY for weekend house rental possibilities: 845-532-4218.